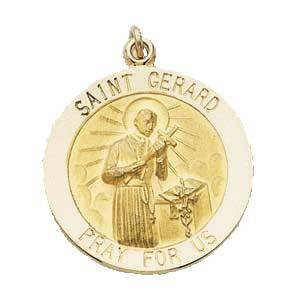 14K Gold Saint Gerard Medal. Patron Saint of childbirth, expectant mothers and pregnant women. Available in 14K yellow or 14K white gold. St. Gerard apparently had the ability to bilocate (be in two places at once) and to read consciences. At one point, St. Gerard was falsely accused of fathering a pregnant woman's child. He chose to remain silent in light of the woman's accusation. The woman eventually recanted her accusation. 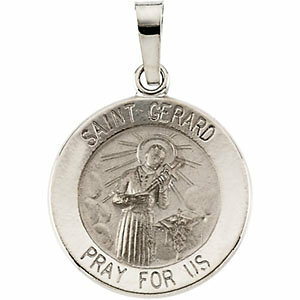 St. Gerard is the patron saint of all aspects of pregnancy.